this is a blank, hardcover journal that i made yesterday. 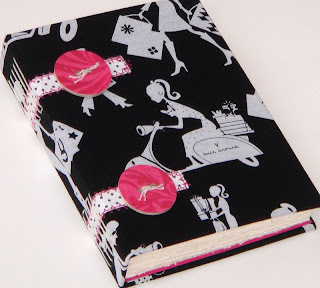 for this book, i used fabric that i bought at the quilt show this past weekend. as with my other journals, the inside is filled with italian velata paper. i sewed some black and white cloth tape to the front and it wraps around the spine onto the back cover. to finish, there are two wooden buttons (made by me by gluing paper to wooden discs) hand-sewn to the front cover using waxed linen thread. i love the black, white and hot pink combination, and while i don't usually use novelty-type fabrics, it's fun to deviate from the norm every once in a while! 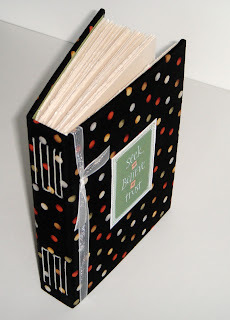 today i'm going to the quilt show with my friend eva, but before if go, here's a quick peek at a book that i made using multi-colored dots on black fabric. i printed one of my ACEOs onto canvas and then machine stitched it to the front cover. the inside covers are lined with moss green canson paper and the writing pages are torn from italian velata. 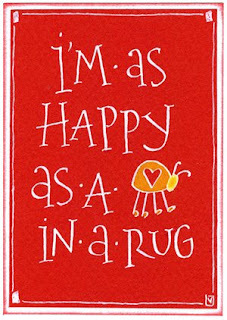 i hope i find some really great fabrics today...i'm always in the mood for adding to my collection! this is some of my all-time favorite fabric...well, actually, my list of all-time favorite fabrics is quite long, but this fabric is definitely in the top ten. anyway, i had just enough left to create this blank journal and i'm really happy with the way it turned out. it's constructed in the same manner as the journals from the past few days. 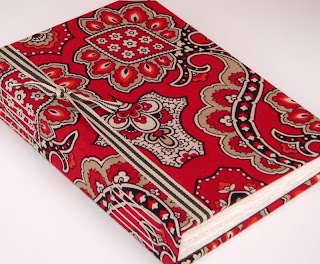 i've placed all of these blank journals in my etsy shop, hoping that this one ends up in the hands of someone who loves this fabric as much as i do! 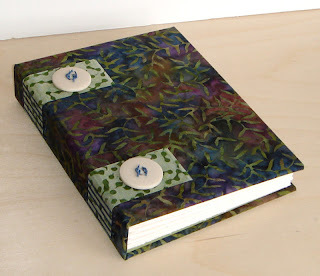 here is another hardcover blank journal that i made, this time using batik fabrics for the outside covers and light green canson artpaper on the inside covers. this book was constructed using the same techniques as my book from yesterday. i have lots of italian velata paper, so there are 60 pages of that inside this book. 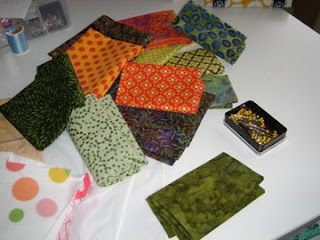 i also have lots of fabric...so consider yourself warned! yesterday i was playing with fabric, and made some bookcloth by fusing mulberry paper to the back of the fabric. 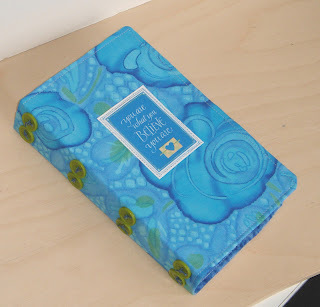 here is a book that i finished, using the bookcloth that i made. inside, there are 60 pages of hand-torn italian velata paper and they are stitched to the book spine using a long-stitch variation and waxed linen thread. for decoration, i used some gaffer tape i had (glad to finally find a use for that!) and adhered it around the spine. this was fun to do...a little time consuming, but what isn't?! i've always been a "collector" of fabric. i can drive right past the mall with no anxiety, but get me within a few miles of a quilt shop and my radar goes off. in my world, this pile of fabric means an afternoon of fun, especially on this rainy afternoon. 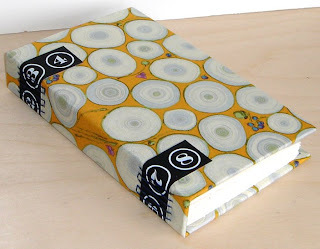 so, today i spent some time making my own bookcloth by fusing mulberry paper to the back of my favorite fabrics. i think that they'll make great books...i'll try to finish one today and share tomorrow! i'm working on some new projects today, but nothing finished yet. so, i'm posting another piece of artwork that is currently hanging in an exhibit called "Beauty of the Word". 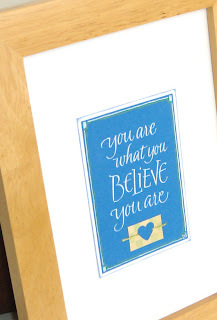 this was created by transferring my lettering onto handmade paper squares, and then stitching the squares together onto a larger piece of art paper. to add some dimension, i used skeleton leaves and heart charms within the blank squares. the final result is somewhat like a paper quilt...and i loved every minute of it! 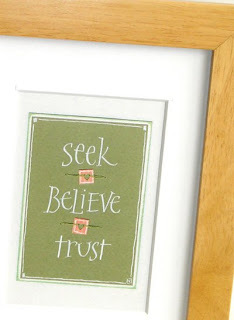 as i was reading scripture the other day, the words "believe" and "trust" came up in several different passages. i think that in order to come to the point of believing or trusting, you first have to be seeking. so...here is the latest in my "so true" series. as with the others, i lettered this on a piece of canson paper using dr. martin's bleedproof. 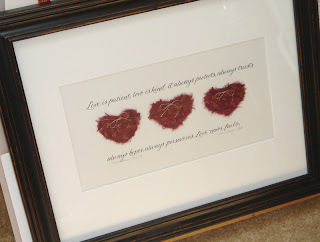 i stitched the two open hearts onto the piece using embroidery floss. creating artwork on these 2.5 x 3.5" pieces of paper forces you to keep it simple...it's challenging, but i'm enjoying it! 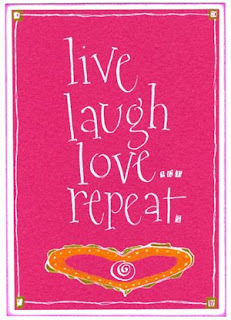 here is another addition to my "so true" series...and i think that it really is so true! 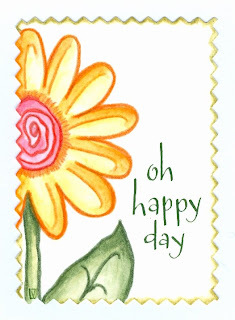 this piece of art measures 2.5 x 3.5", the standard size for an ACEO (art cards, edition and originals). 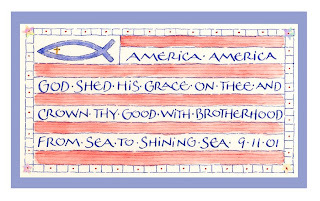 the lettering was done using dr. martin's bleedproof onto blue canson paper. to finish the piece, i stitched an open heart that was punched from a piece of decorative card stock that i had. i'm really enjoying working on these small pieces and have several ideas for making more of them. this photo shows the artwork framed, however, tomorrow i think i'll try using it another way...details at eleven. my sweet daughter, melissa, put in a request for shoe note cards a while back...and here, finally, is the result. i took four of my drawings from a few months ago to make this set. 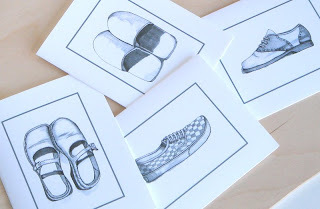 of course, now i have all kinds of ideas for new shoe series...what i really need to figure out is how to squeeze three or four more hours into my day so that i can finish all of my projects! about a year ago, we were walking through beautiful, historic charleston, south carolina....and came upon this sign behind an old church. setting aside the obvious, could this really be such a problem that it requires signage? it looks like all of the gals in pollyanna's garden got together for a little party! 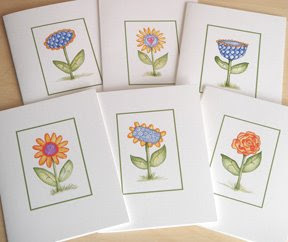 well, sometimes i do wonder what goes on in my studio when i'm not there...but, actually, these are just some notecards that i made recently using my flower images. setting up the template in photoshop was the most time consuming part, but, in the end, i'm happy with the result. they look great printed on linen card stock and i placed a piece of speckled bond paper inside to make a smooth writing surface. 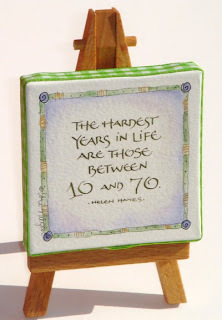 i have memories of my mom saying this to us when my brothers and i were growing up. so, i figure if my mom said it, it surely falls into the "so true" category...which makes this the second in my new series. i was curious to see what it would look like framed, and, unfortunately, i didn't have the correct size frame. my preference for this piece would be a black frame and i'm sure that we must own a 5x7 black frame, but i don't know where it's hiding. these small 2.5 x 3.5" pieces of art are fun to do, but i'm learning that simplicity is definitely the key! this is the first in my new series, "so true". 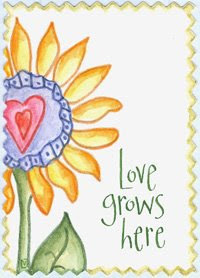 all of the artwork in this series will measure the ACEO size of 2.5 x 3.5" and focus on a short quote, quip or truism. this piece was written on canson paper using dr. martin's bleedproof white (which is like gouache and used by photographers and graphic designers to do touch-ups). while i like to work on a smaller scale, i think that this will prove to be a fun challenge! we'll see how it goes! i still have some "pollyanna's garden" ideas floating around in my head, and i've been wondering what these little gals would look like in a grouping, so i had to satisfy my curiosity. it looks like check-mate and swirly girly have been friends for a while...and pollyanna couldn't be gladder about it. allow me to introduce you to my studio mascot, molly. 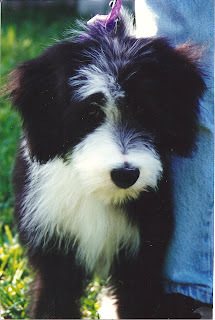 this photo was taken of her when she was a puppy, but she still looks the same, except her ears are a little longer now. as far as studio mascots go, she's the best. she's great at keeping secrets, and even turns a deaf ear when my work isn't going well and i say bad words. she cheers me on at just the right time and her demands are few, so it's very easy to spoil her...and believe me, i do! we moved into our new rental almost a week ago, and for the past several days i've been hearing this little voice nagging me to finish putting away all of this "stuff". the past two days have been studio time, but today was the day that i finally tackled the spare room/storage room...this is the room that we literally put in everything that we didn't know what to do with. by the looks of this room, we didn't know what to do with a lot of stuff! and as i've learned with most unpleasant tasks, you can't really think about it, you just have to do it. so after a long day of hard work, i'm happy to report that i have paper and portfolios behind every door in the house, there is no room left under the beds, and the goodwill pile has grown again. so, nothing to creative to show today from my studio, but, finally, i'm starting to feel moved in. after all of this moving and getting settled in, it felt good to hold a watercolor pencil in my hand and do something creative. today i decided to do a small original, an ACEO (art cards, editions and originals). 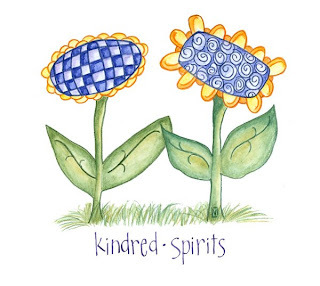 these pieces measure 2.5" x 3.5" and are highly collectible by many artists. i've certainly done better lettering in the past, so it just goes to show how important daily practice is! of course, this piece is meant to be whimsical and a little off-beat, so i guess it turned out just the way it was supposed to turn out. so, good ol' pollyanna strikes again, just when i needed her...makes me kinda glad, you know? elvie studio is open again! welcome to my new studio! i have worked all weekend to get everything organized. hopefully, it's not so organized that i won't be able to find anything! anyway, i was definitely dreading this task, but now that it's finished, i'm happy with the result. i have lots of natural light coming through the window behind my work table, and there's room to walk around, so i'm hoping that inspiration will come to visit me here often. now i just need the motivation to get the guest room organized and we'll be completely moved in....!